Review: Set in Paris, France, a young man inherits a flat from his father. Once arrived at the flat he finds it has been occupied by an old lady and her daughter who refuse to leave. Utterly dreadful and predictable film. This is apparently a stage play from 2002 and from the film very much looks like a stage play. Also this is Isreal Horovitz’s debut at the age of 74. All the actors put everything into this and tried their best. They didn’t have to think much with this. It is just like they turned up to the studio and did what they had to with little effort. 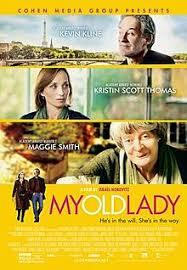 Both Kristin Scott Thomas and Maggie Smith both worked on Keeping Mum (2005) together. This could have been a film that was made 15 years ago and would therefore have been more accepted as a film.